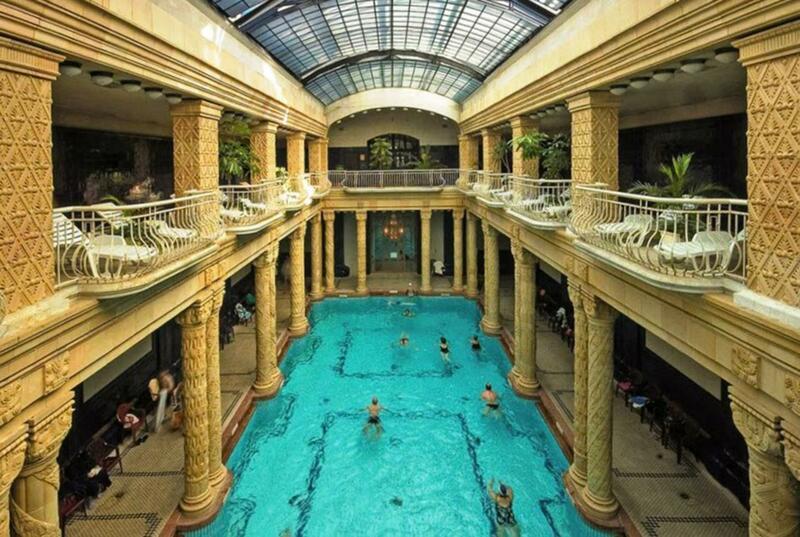 Skip the Entry Line to the famous Gellért Spa and have a relaxing day! Have a bath experience of ancient times with authentic spa facilities and carefully crafted architecture to admire inside the most beautiful spa of Budapest by the Gellért Hill. The Ottoman Empire utilized the flowing gold of Hungary and introduced the land to a whole new style of bathing culture during the Middle Ages raising the level of Budapest’s spas to a whole new level. The Gellért is one of the most famous Turkish style baths of the city built in spectacular Secession style 100 years ago. The building, together with Hotel Gellért, are true icons of the city preserving the atmosphere of the 1900’s and implementing it into the 21stCentury. Since the last 10 years of its operation, the spa has been coeducational to adapt to demands and values of a whole new generation providing a smooth blend between a historic bath and modern day spa principles. Enjoy a whole range of services and treatments in the luxury massage rooms and private bathing facilities of Gellért and feel like royalty within the walls of the city’s most spectacular spas. With 8 thermal pools, swimming pools and an outdoor thermal bath, the Gellért is truly a place for all seasons. Enjoy the open-air wave pool or swim a few rounds in the swimming pools of the spa. Several steam baths, saunas massage specialties such as the exclusive lavender dream treatment and numerous therapy services guarantee an enjoyable, health improving experience within the adorned walls of the Gellért. Don’t leave anything to chance and have all the essentials of an unforgettable bath time with the I Love Spa Package! Important: The ticket is only for one-time entry! You cannot exit and reenter the bath! The massage is mainly used for locomotive issues and disorders. The masseur finds the problematic areas and applies a personalized treatment for you. A calming, gentle massage applied with slow and soft techniques.High quality, skin-friendly oils are used for a pampering experience. Its main purpose is relaxing the muscles. Refreshing head massage 20 min. Refreshing foot massage 20 min. Royal thermal massage 20 min. This stronger massage is based on Swedish techniques with a deep tissue effect providing an all-around treatment. Using a special thermal massage oil made from local thermal spring water, this therapy has an enhanced healing effect on the locomotive system. Harmony aroma massage 60 min. As a sweet pamper, the Dreamy Elderflower Massage provides a rest for the body and soul alike. With gentle movements, a selected part, or your full body will be treated to the stunning effect of this miraculous massage oil. With the refreshing power of citrus oils, the Orange Joy massage will prove to be a true energizing experience. Gentle movements are applied on a selected part of, or your full body or a healing effect from the queen of all citrus fruits. Utilizing the immense power of this ancient herb, you will be introduced to the healing world of the Hungarian herbaria. With gentle movements, a selected part, or your full body will be treated to a rejuvenating miraculous serenade by this 100% natural oil. This 60 minute long full body relaxing massage is based on the popular aromatherapy method. Four different types of fragrance oils can be used for the treatment, the choice is yours. Private Bath with champagne and fruit for 2 people + sauna. All of our ships are air conditioned/ heated and have panoramic windows. Hungaria Koncert help desk is located in the Gellért BATH by the main entrance on the left-hand side. Check in is between 09:00–18:00. The facility closes at 20:00 and the guests stay until closing time. However, you have to arrive before 18:00. If you have a booked massage you have to arrive at the Help Desk 40 min. before. H - 1118, Budapest, Kelenhegyi út 4.